I don't often work with fabric limited by quantity or pre-cut, particularly long narrow strips. Revisiting my old favorite - the Half Square Triangle - quickly became part of the design equation to make a quilt with a RPQ touch. I was a little surprised to look back and see that I haven't worked with Half Square Triangles all this year! Hours of trimming HST's to just their teeny right size. with gentle pressure from a hot steam iron. An adaptation of my Flock of Flying Geese Quilt made in June 2011. I can't wait to start quilting. The pressure is on not to overdo (and over think) the quilting design. Super cute! looking forward to seeing your choice of quilting design. Rita, you simply must play with half square triangles more often. The effects are stunning. Your top looks gorgeous! I love the pattern that you did, and can't wait to see it quilted! So clever Rita, I wish I had half the eye for color you do! And the background choice is perfect, a little quieter look which let's these colors sing. Oh wow! You are amazing!! And brave!! All those seams and trimming! This is a stunner for sure!! Perfect background choice! Wow, love this layout and the colors! All those half square triangles. . . I love your designs! This is just beautiul Rita! Each color is able to play by itself or be part of the big party! Can't wait to see how you quilt it. I actually gasped out loud. You just took the fabric and threw it to the next level. That is just beautiful! 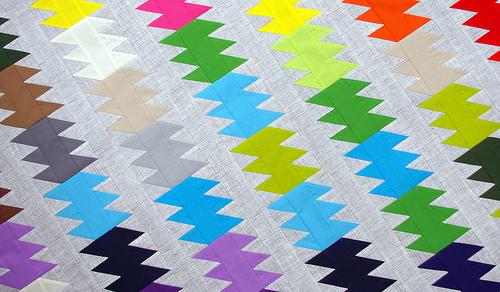 Love, Love, Love rainbow quilts!!! And a fairly simple design that develops into a complex pattern - perfect!!! Gorgeous! perfect background fabric with all those colors! Sigh.... gorgeous. I'd love to try this technique. Maybe in a baby quilt first. I can't wait to see how you quilt this. It's just gorgeous. Rita, that is unbelievably gorgeous. I absolutely love it. Wow. Beautiful. I just love the look that repetitive geometric figures create. Gorgeous. How. Do. You. Work. So. Fast? You are truly amazing. 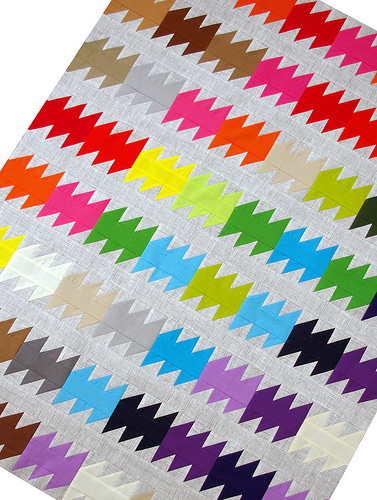 I love this one and can't figure out how you create your quilts so quickly. Do you sleep? ;) I am looking forward to seeing the quilting design and the finish!! amazing and beautiful quilt! can't you make it easier on yourself by cutting diamonds from the strips instead of so many squares and hst's? Then just sew strips of diamonds together. I love love this, Rita. Beautiful Rita. Your work is inspiring! oh! this is so cool! Fabulous use of the Jelly Roll solids. Gorgeous colours which your design uses so dramatically. Superb! oh (wo)man this is gorgeous!!! 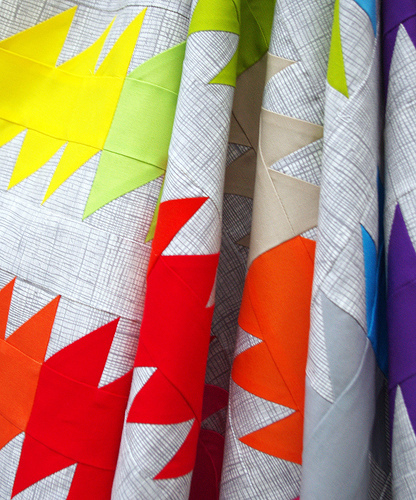 It looks like you took a brand new box of crayons, opened them up, and put little scribble samples of each color on your quilt! I love it! perfect background fabric choice - really great quilt. This is a great background. 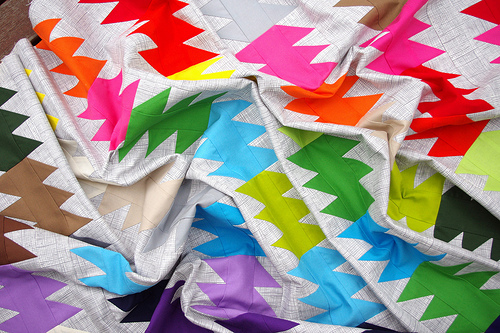 "Heath" is really an awesome fabric to make those colors pop. Cool quilt, Rita. I'm spending the weekend working on Kona solids as well. Your work is always impressive...and this is even more impressive. I love it! Another Rita masterpiece! Love the new colours too. Will have to get my hands on some for a project I have in mind. So pretty! I love that you used this jelly roll :-) It looks great!